23 Mar: Sport is full of challenges, in fact you could say that sport is actually ALL about challenges. We've all heard the saying: "It's not the winning, but the taking part that counts", cliché perhaps, but none the less true. Of course, taking part doesn't just mean turning up unprepared and having a bash, it actually means dedicating yourself to the hours of hard work and overcoming the challenges necessary to be in with a chance of winning. That's truly what it means to Take Part! This year at Dartes we've had two of our young athletes handed a bigger than usual challenge. As a big poke in the eye to the cruel hand of fate both have proved more than equal to it. Despite recently being diagnosed with Diabetes, they're both back in full training and doing what they love to do. So much so that they both played important roles in our teams this weekend at Yorkshires. Despite the inital shock for both of them, we're happy to say they've taken it in their stride and are now rising to the challenge of not letting it affect them in the slightest. We thought it would be good for them (and any other swimmers in a similar position) to see that they're not alone, that in fact there are sports stars out there who are competing at the very highest level who share their intimate knowledge of blood sugar levels. So here we go, on with our shortlist. Rubbing shoulders with you all over the last few weekends at Yorkshire Championships was City of Leeds and Team GB superstar Anne Bochmann. Diagnosed in 2007, she went on to win 3 Gold medals at Euro Juniors a year later as well as representing England at Commonwealth Games last year (you can watch that race courtesy of the BBC). Inspiration, as if it was needed, standing on a starting block near you! You think that one's good? Gary Hall Jr won 4 Olympic medals in 2000, including 50m Freestyle Gold, after being diagnosed with Type 1 diabetes just 1 year earlier! He's a loud, brash American superstar who's father was also an Olympic Swimming Medallist. He retired in 2008 (with 10 Olympic medals) determined to help those with diabetes learn how to control their condition. And of course, away from the pool, but still in the water, is 5 times Olympic Rowing Champion Sir Steve Redgrave. Similarly to Gary Hall, Sir Steve has used his high profile sporting celebrity to show young diabetic athletes that if properly treated and monitored their condition need not prevent them from sporting success. If you prefer your stars to be more mainstream, who would dare overlook the big screen and Halle Berry or Sharon Stone? Being swimmers with no time to visit the cinema you probably haven't heard of either though, so maybe stick with Anne as your chlorinated diabetic Goddess. Remember: dream big, work hard, and monitor yourselves often. We're all proud of you both. 22 Mar: Some people make winning Yorkshire medals look easy. The likes of Max, Joe, and Jarvis seem to simply show up, dive in, hit the pad, and voila, the Gold medal is theirs. Then there are others, like Caitlin, who try as she might keeps on getting touched out in the last few metres by the same girl, over and over again. Needless to say, this is the hard way to win medals. But there's also a third type. This third type of athlete takes not winning medals to a whole new art form. They do just enough to make sure everyone realises that: "Hey, I'm the best here", but they leave the true result in doubt. They put one finger on the medal, and then say: "Nah, you can have it". They let the other girl win, but in a way that doesn't really let them fully celebrate it because in the back of their mind they always know they didn't touch first. It's a tricky skill to master, some of you are probably even now sitting, reading this and wondering: "How on Earth can you do that?". But looking back at the 3 weekends of Yorkshire Championship action, we can proudly claim that here at Dartes we have all three types of athlete. The ones who make winning look easy (after hours and hours, and even more hours of hard training); the ones who make it look difficult (again, after hours and hours of hard training); and we also have Chantelle Waugh (Arm). For those of you who missed Chantelle's ups and downs at her Yorkshire Champs debut, her first event was the 200m Butterfly. A sure fire bet for the 9 years Gold medal you might think (we certainly did). All the way through her heat she was leading her age group. A full 200m of Fly, all the pain, all the agony, and her mum jumping around beneath the scoreboard (yes, we saw you!) Only for the results sheet to report: DQ SA-3L. Roughly translated that means her arms didn't quite clear the water somewhere on the 3rd 50m. Harsh maybe - she is only 9, and it is a 200m Fly! Watching poolside we felt the pain she suffered simply to complete it. A great performance, well done, but hard luck! The rules are the rules. She returned the next morning smile beaming as usual, for her next event: 200m Backstroke. Once again we watched in expectation. This time she touched in Silver medal position. Two strokes heading in to the half way turn put paid to the second medal. Very sporting of Chantelle you might think, finding subtle ways of passing the medals around her competitors like that. She seemed to change her mind come Sunday afternoon though. The 200m Freestyle arrived and she seemed to want to keep this one. The hardest earned Silver medal in Championships history, throw two away before finally taking one home. And then the flood gates opened and business returned to normal. Maybe she just felt a little shy on the first Saturday. 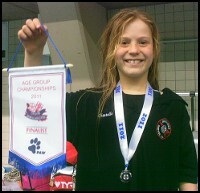 The following Sunday, up she got alongside Iona Holdsworth (Spa) for the heats of the 200m IM. As if determined to make up for the 200m Butterfly, or maybe just determined to keep the City of Leeds girls at bay, off she swam in search of a dominant win. We've added this HDW event to Dartes TV so you can all enjoy watching yet another young star of Doncaster Swimming. It's good for swimmers to not take things too seriously though. Everyone makes mistakes from time to time and end up with occasional DQs; even those who make winning look easy (Joe in the heats of 200m Breaststroke for example; at least two very big names from other clubs did the same on the same day). Better to have a laugh about it and be determined to fix things next time, rather than get upset. So it was good to see a happy, cheerful Chantelle bounce straight back to win medals the next day - keep your eyes on this one over the next few years. There's a serious note in this as well though. Chantelle was in medal winning positions across all 3 weekends of Yorkshires. Amber Hardy (Adw) was also winning medals as a very young 10 year old, and Mark Beech (Spa) was reprising his role as Yorkshire Backstroke Champion for the 3rd year running in the 11 year olds. Jarvis Parkinson (Arm) continues winning medals and setting Club Age Group Records in the 12 year olds alongside Joe Litchfield (Spa). All of them have been training at Dartes since they were 7 or 8, in preparation for their first assault on Yorkshires. The same can be said for more of our young finalists, such as: Iona Holdsworth (Spa) and [Name Removed] (Adw). If this trend of Doncaster's swimmers winning Yorkshire medals at 9 and 10 is to continue, then the next generation need to be given the best possible preparation from the same age. People talk about talent, but in reality, all that usually separates those considered talented from the rest is a better starting point. How many of you now watch our older swimmers and say: "Yeah but with all that talent of course they're winning medals". The truth is, many of them didn't look half as talented a few years ago, and certainly weren't winning medals or earning National Qualifying Times! The standard of swimming in Yorkshire finals these days is so high, that it usually takes a couple of years to prepare athletes in terms of skills and fitness to compete at that level in those early age groups (the older the age group, the longer it takes). Joining the Dartes squad structure at 9 or 10 usually means waiting until 11 or 12 before making finals and winning medals is a likely proposition. Our advice for anyone dreaming of achieving anything in swimming at Yorkshire level or above: start with the single Phase 1 session early. Ideally start at 7 or 8. Dartes Phase 1 is all about learning the skills required to progress quickly. It's a single extra session that makes a big difference at an early age, even if you choose to go no further. So don't just watch the talented ones in admiration as they win medals. Give yourselves the best possible start and make everyone think you have this magical property called Talent. Join Phase 1 early and add a whole new dimension to your swimming. 20 Mar: We'd counted up the points tally after weekend 2, so we were quietly confident of runner-up spot in the age-group team competition. We had a quick glance at the official points tally sheet before leaving Ponds Forge this evening and it looks like we managed to fulfill that dream, but we'll wait for official confirmation. Otherwise Gary from Paw Swimwear will be quick to text to say we're wrong! What we didn't expect was to come home with the B&I Trophy again for most improved club. We felt certain that prize was heading to York who seemed to improve massively this year - well done to them for all their hard work. We last won the B&I in 2009 with an enormous percentage improvement. Then last year we were leading again going in to the final day of sprints, only to be over taken by a few other clubs at the last minute. So to improve again in 2011, and do so by enough to be crowned Most Improved Club so soon after last time is a monumental achievement that everyone should be extremely proud of. The only sad note from the weekend were the rather predictable complaints (yet again) aimed at our supporters celebrating an unexpected win on the last event. What needs to be understood is that our supporters have been muzzled recently due to complaints in recent years about them celebrating every win with that level of enthusiasm (actually most above average swims too -- irrespective of placing). No more horns, no more cow bells, no more football rattles! The complaints we've received for supporting our team in what we believe to be the proper fashion has put a stop to all of that. Today's reaction had absolutely nothing to do with City of Leeds getting DQ'd (we had our own fingers crossed too), and had everything to do with passionate parents celebrating a very unexpected win for a very popular group of boys who've been close to winning that event every year, but have always missed out. The Loud and Proud got carried away for sure - but why not? We like to get carried away! We like to have fun when we go to meets. And there was definitely an element of relief that the DQ hadn't been us! But with finalists no longer being presented to the crowd, and medal presentations being abandoned too, there's little wonder all their emotion from the weekend escaped after a shock result on the last event. Especially as most of us had our fingers crossed behind our backs hoping to avoid a DQ for a very tight take-over of our own. 19 Mar: This year's Yorkshires has seen a bumper crop of Club Records fall, and today was no different. No sooner had Oswald Hood (Adw) sneaked under the 11years 50m Breastroke Age Group Record, than both Max Litchfield (Spa) and Richard Lee (Spa) squeezed beneath the overall 50m Freestyle Club Record too. Oswald resetting the mark set by Reece Fielding (Arm) in the same competition last year; Max knocking Niall Wainwright (Spa) off the books by a few tiny hundredths. Today's pair of records (there might have been more) weren't the only Club Records set during this year's Yorkshire Championships - not by a long shot! Of the 8 Club Records bettered over the first two weekends, one of them was a biggy that had stood the test of time since 1996! Swimming in the 16 year olds age group (if memory serves) at Yorkshire Championships Emma Parker (Adw) won the Silver medal for 100m Backstroke in 1:09.36. During the first weekend of 2011 Championships, Shannon Dodson (Adw) stormed to victory in the 13 year olds event to lower Emma's long standing Dartes record to 1:08.83 and qualify for Nationals by a mere 0.02sec along the way. The link with Nationals doesn't end there. Emma was National Champion in that event in 1992 in a time of 1:10.66. A target for Shannon to emulate perhaps! The mighty T-Rex also snatched the 200m record out of the hands of Laura Hirst (Edl) set in 2009 to take her 2nd Gold medal of the Championships. It's testament to just how good Emma was back in the 1990s, that it's taken this long for some of her age group records to be wiped off the books too. She sits pretty atop the Dartes overall medal table with 8 glorious National Golds to her name, but these past few weekends her name has disappeared from 1 Club Record (above) and 2 age group Records as well. Caitlin Dixon (Arm) being the one to finally bring 100m Freestyle and 200m IM bang up to date in the 13 years, along with 200m, 400m, and 800m Freestyle (the latter an overall Club Record too) and 400m IM. Max was also in record breaking form during the earlier weekends, lowering many of the standards he'd previously set. Younger brother Joe Litchfield (Spa) however, is sneaking along breaking the age group records Max set a few years earlier. Behind Joe, swimming as a 12 year old but still only 11, Alex Pollard (Arm) claimed the younger age group's club record for 1500m Freestyle. It might not last long though, Mark Beech (Spa) is usually considered a Backstroker, but his Freestyle has improved to such an extent that he won Silver in the 1500m and did a fantastic job of pacing Alex through the first 1400m only to watch powerless as the slightly older boy romped home in the final 100m. Expect Mark to have a crack at smashing Alex's mark at NERs - for Alex: you'd better start aiming at one or two of Max's 12 year records! The competition throughout the age groups is hotting up nicely. Remember, records are there to be broken. Dartes has some big names on its record books with some fast times, but don't be intimidated. Many of those breaking records so far this year were no where near them a year or two ago. Why not see how far you are from Dartes Records and set yourself a target or two! 15 Mar: The British Championships at Manchester this year as always were attended by some of the top swimmers and coaches in the world. In the mix were our very own [Name Removed] (Adw), Max Litchfield (Spa), and Richard Lee (Spa). The meet started very positively with a PB for Max in the 400m Freestyle finishing in 4:06 to lower his own Club Record. [Name Removed] progressed comfortably in to the final of the 200m Freestyle and later improved her time from heats and finished with a shiney Silver medal for her efforts. Day 2 saw both Max and [Name Removed] in the 100m Backstroke. Max led out in the first 50m (28.6) and looked strong throughout, finishing in 58.89 just a quarter second outside of his PB. [Name Removed] progressed into the final but was not in top form and struggled to reach her best. Hopefully this meet has been a learning experience for both swimmer and coach alike and we can make the required changes in time for the next set of IPC European Championships trials. The next event for Max was the 200m IM on Day 4. The plan was to go out controlled on the Butterfly and work the Backstroke and Breaststroke, but being placed in the outside lane of a seeded heat (i.e. slowest) Max got a little carried away down the first 50m and tried to stay with the big guys. This had a big effect on the 2nd 100. Again though this was an important learning experience and hopefully it will make him remember that you don't necessarily need to be leading on the first 50; a quarter second too hard at the start might cost you 2 seconds by the end of the race. Day 5 was Max in the 200m Backstroke, an event he has struggled to move on since winning Bronze at Nationals in 2009. Hopefully, now was the time for a long awaited PB. After going out too hard in the 200m IM I asked him to control the first 100m and then push on at the turn going into the 2nd 100m. He stuck to the race plan and finished with splits 30.20/33.74/33.00/33.23 for a PB and lowering another of his Club Records to 2:10.17. This swim should now give him the confidence to move this event on even further. Day 6 saw Richard stepping up for the 50m Freestyle. He started with the fastest reaction time of all the competing swimmers: 0.64. This has become a trade mark of his and he was leading at the 25m mark and going strong. One little slip with a breath about 6m out from the finish lost a little bit of speed but he still managed to produce a 25.03 for a new PB and his 3rd NQT of the season. Just 0.06sec slower than the Club Record held since 2009 by Niall Wainwright (Spa) 24.97. The last day of the Championships had the 400m IM for Max. He was in a middle lane and racing the usual suspects from his age group at Nationals last year. He went controlled and looked strong to finish in a time of 4:36.29. It is always difficult for the younger swimmers at this meet because they don't always get the opportunity to reach Semi-Finals and Finals, so they need to be ready to race hard in the heats. It is important for swimmers to learn to swim hard in heats at all meets. Even if they should reach the finals comfortably, or without exerting themselves too much, it is an important process to swim fast heats and faster finals. It helps to prepare you physically and mentally for when you enter a major championships environment (such as Nationals, British Champs and above) where you have to be at your best in the heats to give yourself a chance of reaching the finals. On the whole the weekend was a good experience that enabled me to see some of the best swimmers Britain has too offer, and look at what they do. Not just in their races, but on poolside, and in warm ups and swim downs. I also had the chance to chat with the other coaches and get new ideas to bring back and implement at Dartes. 5 Mar: Call it a fond farewell to Nic Grainger (Spa) before he heads off to continue his swimming career with City of Sheffield; or maybe a welcome to Phase 4 for Georgia Wright (Arm) and Laura Brookes (Edl); or perhaps even a celebration of the start of British Gas Championships in Manchester; whichever you prefer to dedicate it to, this morning was the first 2000m timed test set of 2011 so we thought Phase 5 would like to join in too. Actually we're fairly sure most of Phase 5 would rather not have joined in, but never mind. Firstly, a big thank you to lap counter Angie for braving the boiling hot poolside (83 on the thermometer). With the previous leaders of Phase 4 moving into Phase 5 this month, it was going to be interesting to see who would step up and take over. Fastest P4 time for the 2000m was set by Aaron Walker (Ros) back in September. He wasn't ready to challenge that today, which left the door open for George Scatchard (Spa) to take the helm - just 16sec off the record! Behind those two Holly Brookes (Edl) made her mark, posting a confident fast time on her first attempt. Middle of the pack Mark Beech (Spa) was quick to put Alex Pollard (Arm) in his place. Alex may have claimed the 11 year boys 1500m Club Record at Yorkshires last weekend, but Mark wasted no time getting his own back this morning. Many more big time drops followed, with a few performing their first 2000m test. With all the young guys home under 35mins we enjoyed some good performances this morning.